Taylor Pearson (TP): I’m great. Excited to be here! HM: Yeah, thanks so much for joining me today, I’m really, really excited to have you. I only recently discovered your blog and your book, and then your facebook group through which we connected. I’m really pleased to have you on the show. Just to get started, would you like to introduce yourself to our audience? TP: Sure. So my name is Taylor Pearson, at this point of my life I am author, writer, and also consultant couch. My background for the last maybe half decade has primarily in digital marketing. I’ve worked at a local marketing agency. I worked kind of in-house as a marketing manager on an ecommerce business based in San Diego. We sold kind of a range of things but mostly b’n’b hospitality equipment. And then… Over the past… That was maybe a couple of years ago, over the past couple years I have done kind of consulting around online marketing and also around one of the core business systems so operational efficiency. And then, last year released my first book which is kind of taking me into this next phase. So I am kind of trying to do more writing, more publishing and also, kind of courses and that thing. HM: Sounds great! We will definitely get into sort of the meat of what you do now, and your work on marketing and writing, but the most interesting thing that I noticed on your website is that it says that you used to be a Brazilian Super Bowl champion? TP: Haha, so yeah, I graduated from college and I had no idea what I wanted to do but I really wanted to get out of the States. I’m from Memphis, Tennessee which is kind of a small to medium-size city in the Southeastern U.S. And I kind of had this sense that whatever it took, I really wanted to kind of escape or to just like see the world that was not something that… You know, many people around me were doing the kind of… Everyone stayed in the same area and did kinda the same things. And so, yeah, I met this guy through a friend of a friend who had an English school in Brazil and he said, you know, “If you come teach in my English school, you know, you can make enough money to live in Brazil.” And I said, "Great." And so I bought a plane ticket to Brazil to teach English, and I ended up discovering there was a Brazilian American football league which I didn’t even know existed. But I played football in college, American football in college, so I started playing with a team for the nine months I was there. I happened to join the team that was already the best in the league so I was kind of free-riding along and we ended up winning the Super Bowl. The Brazilian version of the Super Bowl. HM: That’s amazing! That’s super cool, I didn’t even know there was a Brazilian Super Bowl. That’s super cool. But that was a sort of a hobby or a one-off thing you did, you didn’t continue playing? TP: Nah, it was a… I used to go, like, semi-pro at the time. So no one was, like, it wasn’t like a full-time thing for anyone but they would cover your travel expenses and your free food, and equipment. So it’s a kind of fun thing I was doing on the side. HM: Ok, cool. Great. Getting back to your main thing, so, how did you get into writing? TP: That’s a good question. I think I’ve always been into writing to some extent. I won like a Civil War Writing Competition when I was in fourth grade that I remember entering and winning. The book Dune is one of my favourite books of all time, I read it for the first time when I was in eighth grade, and I tried to write an equivalent amazing sci-fi novel for the whole eighth grade to very, very poor results. But yeah, there was something. I studied history in college and studying history basically means writing papers. So it was something that I’ve kind of always, I think, done. And really, it was in the last couple of years that I went from something that I was doing on the side, so I was doing a lot of, like, management consulting and digital marketing, and being a part of that, and it was also something I was doing on weekends. I had the first couple of years of my writing career as it exists now was on Saturday mornings. I would go to the coffee shop and I would write, spend two to four hours and write a blog post and publish it. It started the snowball rolling and, eventually, that it got enough momentum, kind of became the whole time thing. HM: Ok, cool, so is that’s how your blog as it exists now started? TP: Yeah, it started as a… I was basically working with this… I think I started in Brazil initially and it’s kind of just as a way to catalogue my learning. And I think the other thing I really realised about blogging and podcasting… Kind of anything you publish on the internet… It’s just a great way to connect with people. That someone can see and kind of make and read a couple posts, and kind of get a sense for what you’re about. And so it wasn’t super strategic in the initial stages. So it started as a hobby and I think more than a hobby, it was something that I wanted to kind of start to collect the body of work that I thought that it would be valuable sometime in the future, and also as a way to connect with people. There was actually a blog post I remember reading by Derek Sivers, and I still remember the URL, sivers.org/xn, and it kind of says that, you know, if you wanted to meet people that were doing interesting things, you used to have to move to the city. You know, if you wanted to be in music, you’d have to move to LA, if you wanted to be in books, you’d have to move to New York, and that was kind of the thing. But the internet created this possibility where you don’t really have to move to New York or LA, you just have to kind of move to a certain corner of the internet where other people are writing and talking about these things. So I kind of started the blog as a way to move to that corner of the internet. You know, if you wanted to be in music, you’d have to move to LA, if you wanted to be in books, you’d have to move to New York, and that was kind of the thing. But the internet created this possibility where you don’t really have to move to New York or LA, you just have to kind of move to a certain corner of the internet where other people are writing and talking about these things. HM: Ok, cool, like, can you give us a few examples of what you were writing about, who were you writing to, did you have an audience in mind? TP: At the time, it was mostly kind of a way of cataloguing and organising how I was thinking about business and my career. So I would go and, you know, from Monday to Friday I was doing online marketing and then the rest of the time I would talk out marketing and business and entrepreneurship. So that kind of the group that I was trying to cultivate, the other people that were interested in those ideas. HM: Ok, great. And then, over time, did you find that that sort of content or that topic was doing well, and you found you connected with people? ‘Cuz that it’s still… remains your focus, writing about entrepreneurship. TP: It is. I think that the writing is getting more targeted in terms of exactly who it’s for. It used to kind of be… It’s always been something kind of professional, it was never like dating or relationship advice, or health advice. But it was kind of just whatever professional thing I was thinking about. Was kind of… Was starting and I found… Certain things interested me more than other things, and I wrote more about those things, and certain things resonated more with people than other things. And so I started to kind of do like that Venn diagram overlap of, like, “ok, we know what’s something that I’m interested in and other people care about”, and sorta focus on that, that kind of central point. HM: Ok, great. And you said, at the time, Monday to Friday, you were working doing marketing stuff. What kind of marketing? What were you working on? TP: So the main company I worked on, I was actually... I was hired by two entrepreneurs. It was relatively small, we had 20 or 25 people. E-commerce business based in San Diego. Our main… We had a few product lines, we sold cat furniture, we sold valet parking equipment, like the black boxes that parking valets will keep your keys at when they park your car. And then we sold portable bars which were, like, you need at a wedding or special event. They roll the bar out into the lawn or into the ballroom, and kinda have portable serving space. And so that was the main company I worked on. It was… They just launched it when I came in the company, they felt like it was like the biggest growth potential. It was the smallest part of the business at that point. So I spent two years really focused on growing that and, by the time I left, it was the biggest part of the business. HM: Oh wow, cool! And was it that experience that led you to write the book? How did the book come about? 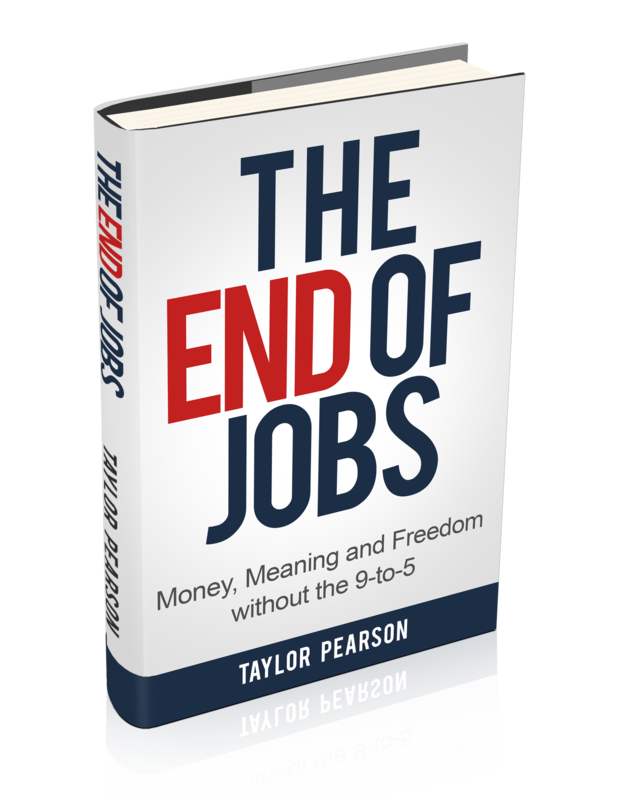 TP: The book’s called The End of Jobs and the premise of the books is that jobs are getting more competitive and less profitable, and entrepreneurship is giving safer, more accessible, more profitable. So the company I was working with in San Diego, was run by two guys who also run another company which has a podcast associated with it, called Tropical MBA. And so they were running this one company in San Diego and selling B2B e-commerce. And then they were doing sort of what I was doing, and they were part of an inspiration for what I ended up doing. They would get on this podcast and talk about, like, “Hey, we got this e-commerce company and we run it, you know, mostly remotely…” One of them lived in Asia full-time and the other one was in San Diego part of the time, but also travelled a lot. And they were sure to talk about, you know, how do you run the business over the internet, what is that, what is it like. And so that eventually turned into a business in itself. They had a community of kind of travel-minded entrepreneurs and they had an event every year in Bangkok. That was kind of the genesis of the book, that I had also these two very different groups of friends in my life. I had friends I’d grown up with, most of whom were kind of traditional careers, particularly in the Southeast, which were in, like, you know, accounting, corporate, middle-level manager, lawyer, doctor. And then I had this other group of friends who were kind of technologist or marketers, and had these businesses that they were either working in or working with. A lot of them were living in Asia and their careers were moving much, much more quickly than kind of my friends in traditional career paths in, you know, Memphis and Birmingham, Alabama, where I went to college. So the book was kind of examination of what acquires these outcomes so different. You know, why are people on these two different tracks, both of whom are intelligent, often hard-working, getting such different outcomes? HM: Right. Yeah, you mentioned The Tropical MBA, that’s one of my favourite podcasts. So for the listeners, if you don’t know about that one, you definitely need to check it out, especially if you are interested in starting your own business, or just exploring entrepreneurship, absolutely amazing bunch of people doing that one. Yeah, so I actually just finished reading your book today. To be honest, it was a very quick read, but yeah, I found it really, really fascinating. Just the whole thesis of the book and how you present it, and all the various examples that you give throughout the book. I wanna dig in a little bit more about the main thesis of the book. And the book is called The End of Jobs and like you just said, it’s about how entrepreneurship is actually now the safer option, rather than getting a job. But do you really believe it’s the end of jobs, or do you think it’s just that more people are going to be entrepreneurs? TP: So I actually took… The title of the book was inspired by a book called The End of History, or really, it was an essay, it turned into a book by a guy named Francis Fukuyama who was actually a political economist. But he wrote this essay right after the fall of the Berlin Wall called The End of History. And kind of the premise is, you know, for all of history there had been these kind of different major competing political, economic systems. So, like, over the course of the 20th century you saw fascism and communism, and then there was, you know, liberal democracy. And so what the essay kind of says, you know, when the USSR kind of resigned and went away peacefully, that that kind of communist structure was the last real competition in terms of a form of government other than liberal democracy. And that, you know. We are on this path where over time, eventually all governments are gonna move towards the principles of liberal democracy. I think I am saying The End of Jobs is kind of the same way equal to the end of jobs the same way we were the end of history in 1990. This is the direction everything is moving. All previous forms of organising work, I think are being disproven. So what you call, like, peak jobs would be a more accurate term. 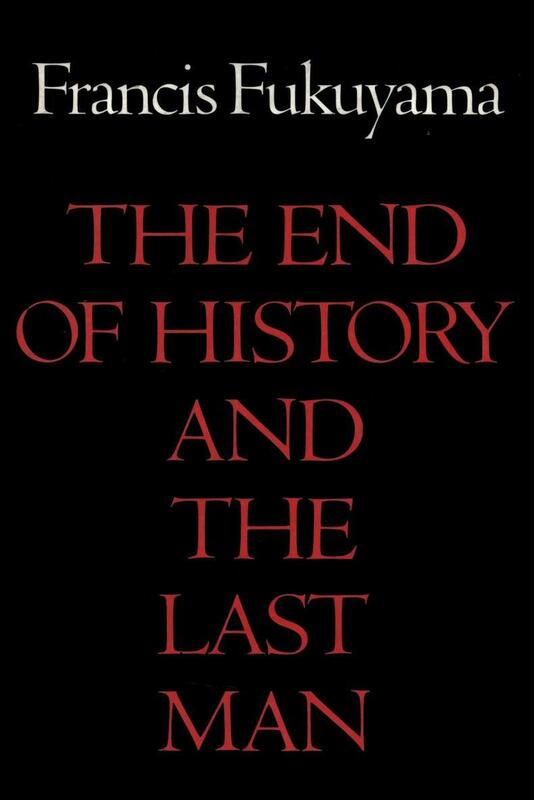 Francis Fukuyama's The End of History and the Last Man. Copyright Wikipedia. HM: Right. Yeah, because one of the things that I remember from the book is there is a table which sort of shows the gradation of, you know, someone who’s completely running their own business and not in the job, or in college or university. And that’s a 100% entrepreneur. And then you can go down where you maybe are in a job but you are doing some entrepreneur pursuits on the side. Maybe you have a side project or a side business or you’re just entrepreneurial in your job. And then you just only do your job and you… sort of the oldschool, and that’s 0% entrepreneur, I suppose. That seems more, you know, people fall along this spectrum more rather than at both the extremes. TP: Yeah, I think so, and that’s, I think, one of the things that I wanted to kind of explore in the book and talk about, which is when we talk about entrepreneurship, or when you read about entrepreneurship in the press, that usually it gets kinda very closely associated with Steve Jobs or Mark Zuckerberg, those kind of figures, and it’s portrayed as something you’re born with or, you know, there is this special chosen people that do this. So I kind of want to debunk that mythology and say that it’s just skillset, right? It’s like, you know, learning to lift weights, or learning marketing, or learning coding, or whatever. There are certain principles and there are certain ways you do it, and you practice it over time, and you get better and better, and better, got it. And yeah, you know, there are kind of ways you can go through that progression. HM: Yeah, I have this quote from your book in front of me. “Entrepreneurship is a skillset that can be acquired.” And you talk about this one specific method, the stairstep method, which Rob Walling talks about. Do you wanna talk a little bit about that? TP: Yeah, so Rob is a guy interviewed for the book. 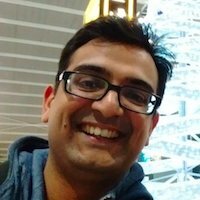 He runs a podcast called Startups for the Rest of Us which is also a great podcast, particularly for technical founders or aspiring technical founders. I think Rob started this really inspiring… mainly because how very small it started. So Rob, he started his first product, was a duck boat e-book, so he had this instructional guide for duck hunters in the US. These people that construct these boats and hide them from the duck so that they can shoot the ducks when the ducks don’t see them. You can’t buy them prefabricated, you have to kind of buy another type of boat and modify it. And so he wrote an e-book explaining to people who you modify, you know, the kind of stack boat, to make it into a duck boat. And that was his first product! And this product, as far as I know, is still the world’s foremost authority on custom duck boat e-books. And over 10 years, he started to stairstep his way. So he started with a product that is single-sale so it’s not recurring, it’s not SASS, that was targeted at a specific market so it’s very like, you know, people wanting to go duck boat books, it’s also very uncompetitive. So it’s able to get traction relatively quickly, like he’s ranked number 1 in Google for how to build a duck boat pretty quickly. And so that was the kind of first thing that he built on. He saw these other projects, wedding websites, a kind of a consulting basis, you know, if this wasn’t the kind of early 2000s when there were all these kinds of wedding websites builders, if you want to throw a wedding website, he’d build one for you. He had a job board for electricians, he had some accounting software, now it’s kinda maybe his first step after he moved from simple products to software. So he’s had some accounting software. 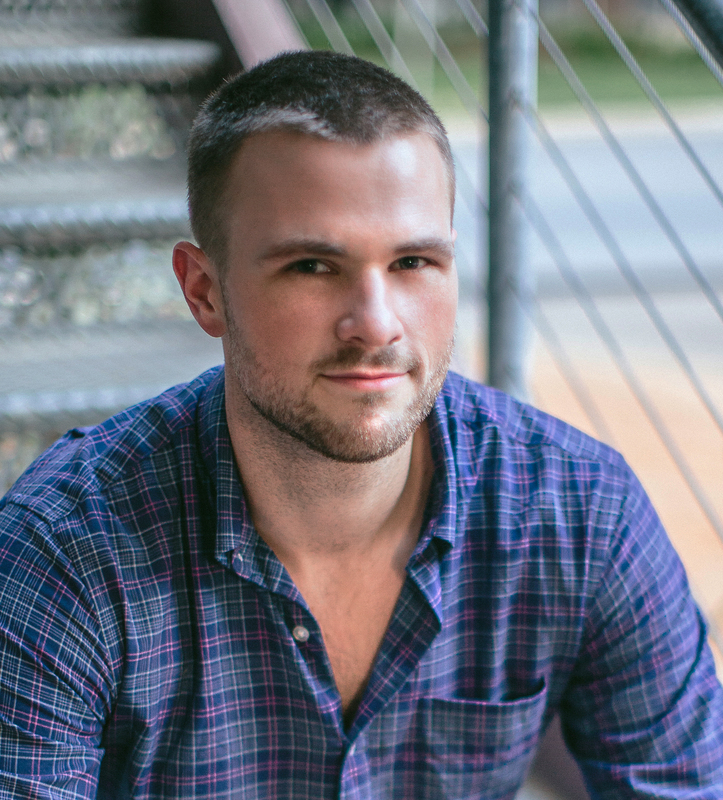 He moved from accounting software to an SEO software, called HitTail which he recently sold. But he bought it, kind of revitalised it over 5 years, and then sold it. Now he runs, you know, a seven-figure e-mail marketing software service company that’s doing very, very well and growing very, very quickly. And so… Kind of his experience in growing through this and you know, over the last 10 or 12 years, looking at other people trying to do the same, the thing he kinda saw was, you know, we read these stories in the press about Mark Zuckerberg or whatever, and people try and go for the moonshots. But that’s the people who started with simple products, with simple business models, and then stairstep their way up to more complex products, more complex business models, recurring revenue, had a much higher long-term rate of success. HM: Right, yeah, I mean, would you say that applies to your own career as well to some extent? TP: Yeah, I would say very much. I mean, I worked in… A lot of what I learnt, I learnt working in a job, basically, working in an entrepreneurial company. So I worked in two companies for the total about maybe three, three and a half years that were under 25 people. I worked directly with the founder and I had a lot of kind of leeway over the direction of the company, particularly the direction of the marketing which is kind of the skillset I was building. So that was kind of my first stairstep, and I would call that an apprenticeship that I went to… These people weren't kind of the types of businesses I wanted to be able to run and I worked directly with them. Because I wanted to understand how this business was run and, you know, what it felt like to be inside these businesses and how they grow, and the systems they were using, and everything else. So that was kind of my first step. Maybe my next step was kind of independent consulting doing my own thing. And then the next step for me was the most recent one which is the book, which was my first product and now I’m working on other products and planning on releasing a masterclass product in a few months. So that’s kind of my next stairstep. HM: Ok, wonderful, that sounds really interesting, especially given what we’re doing here at Learnetto. Just briefly, I wanted to get into a little bit about your coaching. So I was looking at your website and you have a lot of very useful content that you provide for free to people to find out what you do professionally. And one of the things I noticed was daily rituals, weekly reviews, and quarterly planning. Do you wanna tell us a little bit about that? TP: That’s actually what the masterclass is going to cover. That’s been one of the things that I’ve been developing over the past four, five years for myself personally. There’s a great book, actually, called Getting Things Done by David Allen. It talks about kind of personal productivity system and I read that about 5 years ago and it was really helpful. It was kind of organising myself and learning, you know, how to manage task and plan. So I’ve been kind of revising and updating that over the past 5 years. And I’ve been planting some of the holes that existed in that system that, you know, doesn’t really deal with how you operate in an entrepreneurial environment. So it’s very good for if someone is telling you what to do and you just kinda have to manage all the incoming task and put them on your to-do list. But if you have to actually figure out what to do, how do you do that. And that’s kind of system I developed which is how do you set quarterly goals, break those into weekly chunks, break those down into daily chunks, and then actually make consistent progress every day towards your long-term goals. HM: Ok, and who is it aimed at? Who’s the audience for this training? TP: I think that’s kind of what I am trying to figure. And I think one thing that happens a lot, at least for me, with things I release is that people that respond to them aren’t always the people I expect. But it’s targeted kind of at what I would call people that are within a thousand days of starting a business. What I mean by that is, I think, people kind of have their lead up, there may be two or three years, they start to hear about people running businesses, people doing these kinds of things. They kind of start to acquire these entrepreneurial skills, either on the side, or they goin’ entrepreneurial position in the company. And then, maybe those first three years when they’re really kind of still figuring out the kind of block and tackle basics of their own business. So it’s sort of people in that window. HM: I see. Because, I mean, it sounded like I need to take this course. You know, because I don’t follow GTD as such, I have my own, you know, ad hoc system that I’ve created. I’m mainly using Trello and, you know, sort of personal notes which I’m following but the idea of reviews and sort of quarterly planning, that’s definitely very appealing, and I need to do it in a more systematic way, I think. So I will definitely check out your masterclass when it comes out. I briefly wanted to talk to you about the community you’re building. Why are you doing all these things? 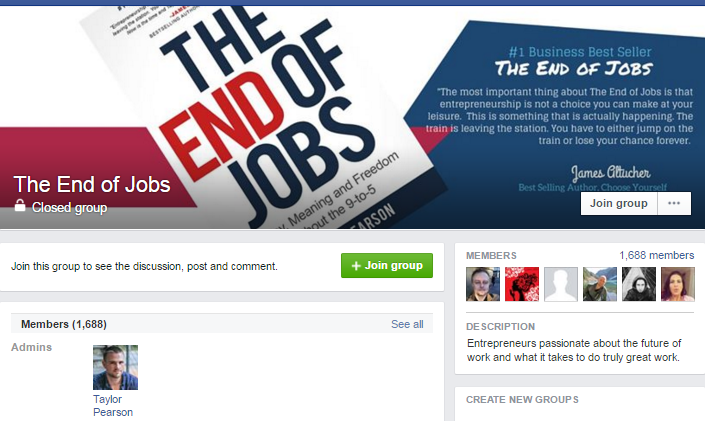 So I joined your facebook group for your book The End of Jobs and I am absolutely blown away by how active it is. It has almost 1,700 members (last I checked) and it really feels like a real community. How did that start? TP: Well, thank you. I am actually really excited about that. So it started as… One thing I kind of learnt in marketing is one of the best marketing tactics is to really get people… Not necessarily tactics, but kind of strategy, is to get people really involved in the product. But, as you’re kind of building the product, if you get people involved, for they feel ownership of it, they’re gonna be… One, they’re gonna be very supportive when it comes out, which is great, and also gonna give you feedback to actually make the product better. So you could come out with a better product that’s gonna be more well-received and better supported. But, as you’re . . . building the product, if you get people involved, for they feel ownership of it, they’re gonna be . . . very supportive when it comes out, which is great, and also gonna give you feedback to actually make the product better. So you could come out with a better product that’s gonna be more well-received and better supported. And so that was the kind of genesis of the facebook group. I started writing this book and I had a few hundred, maybe two or three hundred readers of my site at the time. I said, “Hey guys! I’m working on this book, and it’s about this topic, and I’m starting this facebook group and kind of talk about what I’m doing. I mean, what I’m writing, my writing strategies or my marketing strategies for this book and what I’m reading and the research I’m doing, and if you’re interested, let me know and I’d love you to participate a bit and get your feedback.” So that’s where it started with maybe a few dozen people in that group and then, as the book went along and I kind of continued writing it and eventually released it, more and more people kind of came in to that community. And that’s how it’s grown from there. HM: Ok, cool. Yeah, I really like your weekly post where you ask, “what did you ship this week?” and, of course, you tell us what you shipped. And, of course, it’s a great opportunity to brag about what you did but it’s really cool… I love the discussion that goes on in there. TP: Yeah, I think it’s… That’s something I always found very inspiring when I, like, see, like a friend I haven’t seen in, you know, three months or six months, and I’ll be like, “Yeah, I’ve got on a list of all the things they got in the last three months-something. Man, you shipped a lot of stuff! Like, I didn’t ship nearly that much stuff! Like, god, I gotta get back on it!” So I think it’s... I like that kind of peer pressure from other people. And, you know, like, they really, you know, they movin’ fast, their ship and stuff, I need to get on this train, too. So I thought it might be cool to do that inside the group. HM: Yeah, definitely. I mean, I guess that’s sort of what the startup accelerator programmes do, right? They have, like, weekly dinner or something and that’s when you see how well your peers are doing. And yeah, that’s a real motivator. So I’m gonna keep falling the group and keep trying to post every week to keep it going. Ok, cool. I think we have one final main question. Just sort of talking about your coaching, your blogging, and your upcoming masterclass, what are your thoughts in general on online education? Where do you think it’s going? TP: So I guess… I mean, one thing I am really excited about is just how accessible it is. I think, you know, it’s easy to, like, lose context, if you’re if you’re kinda in the middle of it. But I was actually at a museum last week, and they were displaying one of the Gutenberg Bibles. So, like, one of the first things that was ever printed on the Gutenberg printing press. I mean, it is this really cool thing because… I mean, that was an amazing moment, right? All of the sudden you could make... I know they printed only 50 Bibles in three months or something. I kind of make some results up. I am much faster, you know, you could have a scribe copy the Bible and then, all of the sudden, you know, created 50 copies of it. I mean, that was kind of an amazing revolution and what happened over the next 500 years with the proliferation of books and knowledge, and access to information was amazing compared to basically all the previous human history. And what was happening with online education is that’s gone to entire new level of magnitude, right? That things, you know, you used to crawl through university libraries to get… Like, I remember having to go to the library and you have file requests with the librarian for which books you ordered… And they would come in, and then you’d only have a week, you’d sit in the library all week and take notes on them ‘cuz you had to send them back. Like, now all these things are, like, on Google Books and you can get them on Amazon for, like, you know, $10 or $20, or whatever. So I think that’s… Just the accessibility of it is exciting to me. And then I think that the other aspect that’s exciting is sure the community that can be built around it. So that’s pretty much what I wanted to do with my book but if you can have kind of a big idea or a goal, or purpose, and then rally people around it, that, I think, really improves the learning experience. HM: Cool, yeah, I definitely agree with the community aspect especially. That’s one of the features and the sort of the thing that we’re trying to really focus on at Learnetto and we wanna try and make a really good community for students learning there. So yeah. So that’s definitely one of the most exciting things about it. Yeah, I think that’s all the main questions I have for you. Just before we go, I want you to tell people where they can find you online and connect with you. TP: So my site is TaylorPearson.me and I am at @TaylorPearsonMe on twitter, and that’s probably the best places. Or come hang out in the facebook group. It called The End of Jobs, if you search on facebook. HM: Awesome. We’ll link to all those things in the show notes, to your book, to your facebook group, and your twitter. That’s awesome. I really enjoyed this chat Taylor, thanks so much for being on the show. TP: Likewise, thank you for having me and thank you everyone for listening.